Before, during and after landfall of Sandy in late October 2013, NYSG-funded Stony Brook University (SBU) School of Marine and Atmospheric Sciences (SoMAS) researchers kept close tabs on the storm. SBU Storm Surge Research Group members Drs. Malcolm Bowman and Brian Colle provided their results via E-mail, the Group’s Web site, and NYSG’s Web site. During the height of the storm, NYSG’s Twitter and Facebook feeds were the primary avenues for providing information as many (including the University) lost power and network connections. In some cases, the group was able to correct some of the storm-related inaccuracies reported about coastal flooding in lower Manhattan. A National Oceanic and Atmospheric Administration (NOAA) GOES-13 satellite-produced image of Sandy descending on the U.S. Northeast on Monday, October 29, 2012. This image shows the storm as it is centered off of Maryland and Virginia, is heading in a northwestern direction towards the Delaware and southern New Jersey coasts. We can learn much from the European experience - we have the advantage of being 75-100 years behind Amsterdam and Rotterdam's situation of being located 6'-12' below sea level - so we can learn. Late October 2014 marked the two-year anniversary of Superstorm Sandy’s landfall in the Metro NY region. Since then, there have been many positions taken by researchers and decision-makers alike on which management response route New York should take: one of resistance (precaution and prevention), resilience (bringing our communities back to their pre-storm state) or re-alignment (evolve and reconfigure what, how and when to rebuild). "I cannot tell you when the next big one will be, but it will come," says NYSG-funded Stony Brook University storm surge expert Dr. Malcolm Bowman. "It's inevitable in the long term. And the sooner we come to that realization, the better." The National Oceanic and Atmospheric Administration (NOAA)'s $1.4M "Coastal Storm Awareness Program" (CSAP) is a multi-year partnership with Sea Grant programs in New York, New Jersey and Connecticut that is intended to raise awareness of how severe weather is communicated to and within communities. Below are updates on several of the 10 funded projects, several of which are administered by each of the three Sea Grant programs. Additional information on CSAP can be found at www.nyseagrant.org/csap. As one might expect, this social science project has much to do with the culture, language, and attitude of people making the profound and often emotional decision about whether or not to evacuate their home before a storm hits. When dangerous storms batter coastal communities, not all residents heed safety advisories. A new study by the Yale Project on Climate Change Communication explores what factors shape these choices. So far, investigators who have been identifying and linking up some 12 million tweets sent during Hurricane Sandy—cataloging them by frequency of use of term—have yielded some interesting insights for everyday people and emergency managers alike. Participants in several New Jersey counties are being accepted into focus groups and surveyed about their use of the various flood warning tools and products made available by the U.S. National Weather Service. Rutgers professor Rachel Schwom is conducting interviews with emergency managers of coastal towns as part of this NOAA-Sea Grant risk communication study. Whether the weather calls for rain, snow, strong winds or something else severe, one thing is for sure: Winging it is not an option. Here's what you need to know about these and other seasonal concerns from NOAA, Sea Grant, the National Weather Service, the Federal Emergency Management Agency and others. As featured on the National Sea Grant Office's Web site, NYSG's Associate Director Dr. Kathy Bunting-Howarth is one of four social scientists from the Great Lakes Social Science Network who evaluated the effectiveness of some warnings put out by the National Weather Service. “Understanding how to best communicate about severe weather is imperative," says Bunting-Howarth. More than two years after Hurricane Sandy made landfall in the northeast, the Sea Grant programs in New Jersey, New York and Connecticut are still dealing with storm recovery issues. Louisiana Sea Grant—whose specialists helped their communities in the aftermath of severe storms including Katrina and Rita—lend a helping hand. The focus of this Spring 2014 conference was on grassroots, community-based waterfront plans developed before and after Superstorm Sandy. As panelists and the hundreds of attendees alike asked during the day-long discussion sessions, we've surely done great planning, but are we doing enough to get the job done? Atlantic Hurricane Season began June 1 and, as documented by National Sea Grant Office 2014 Knauss Fellow Elizabeth Bevand, Sea Grant is helping communities throughout the U.S. prepare for hurricanes for the short and long term. Also, NYSG's Web Content Manager Paul C. Focazio is profiled by the National Oceanic and Atmospheric Administration's National Sea Grant College Program about what everyone needs to know about preparing for a hurricane as well as how he got hooked on science communications and how others in or considering the field might sharpen their skills. What was the outlook for the 2014 Atlantic hurricane season? That was the topic of discussion at a news conference held at the New York City Office of Emergency Management in Brooklyn on Thursday, May 22. Also, New York Sea Grant joins other Great Lakes Sea Grant programs in a social science study to help evaluate more effective weather warnings. The Cornell Chronicle, Syracuse's Post Standard and a string of newspapers, including New York's Newsday, are just some of the media outlets giving attention to the National Oceanic and Atmospheric Administration (NOAA)'s $1.4M "Coastal Storm Awareness Program" (CSAP). This multi-year effort—a partnership between NOAA and Sea Grant programs in New York, New Jersey and Connecticut—is intended to raise awareness of how severe weather is communicated to and within communities. In Sandy’s wake, New York Sea Grant surveyed 250 marinas feeling $85 million in economic impacts, tracked the fate of nitrogen inputs to salt marsh ecosystem following sewage treatment failure, and monitored the growth of Fire Island breach. This Stony Brook Magazine feature examines the efforts of the often-New York Sea Grant-funded Stony Brook's Storm Surge Research Group, whose members offer a bold plan to protect New York City. Since 2010, Stony Brook University (SBU) School of Marine and Atmospheric Sciences (SoMAS) oceanographer Malcolm Bowman, a long-time NYSG-funded researcher, has served on the New York Panel Climate Change and co-authored the recently released, related report. Highlighting NYSG's recent round of research and education to raise awareness of severe storms like Superstorm Sandy. Sea Grant programs in NJ, NY and CT award $1.4M in funds for 10 projects to improve hazard warnings for tri-state residents. As declared by The Village Times Herald, a weekly newspaper published on Long Island's north shore, Bowman was named a "Man of the Year" for raising awareness of coastal storm dangers. A summary of other topical media discussions with the likes of NBC Nightly News with Brian Williams, the BBC, and journalist Dan Rather is also included. 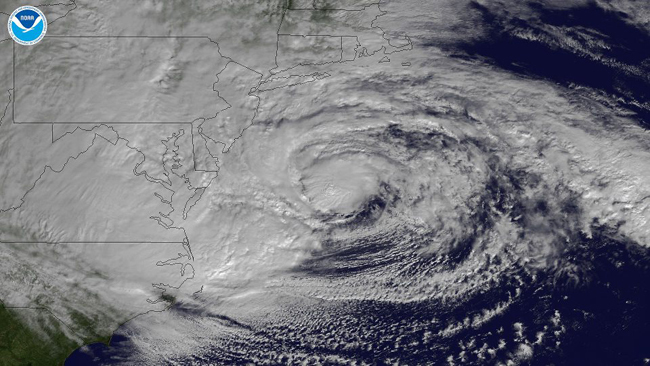 For seven days in the Fall of 2012, Hurricane Sandy pounded the Caribbean and U.S. East Coast with punishing rain, wind, and waves. As the storm approached landfall, the National Hurricane Center renamed the hurricane "Post-Tropical Cyclone Sandy." But to those whose lives were devastated -- it will always be remembered as Superstorm Sandy. At a November 2013 NOAA Coastal Storms Press Briefing in Washington, D.C., NYSG’s Coastal Processes Specialist Jay Tanski offered a perspective on how to implement NOAA-wide initiatives at the local level. As documented in several video clips from Portland, Maine's ABC, CBS and NBC affiliates, Tanski was also a speaker at mid-July 2013's Maine Sea Grant-hosted event Beaches Conference, where over 200+ attendees engaged in post-Superstorm Sandy discussions, among other topics. As discussed by Peyton Robertson, National Oceanic and Atmospheric Administration's Chair of Sandy Assessment Team via Federal News Radio, Sea Grant programs in New Jersey, New York and Connecticut are administering a new $1.8M NOAA-funded Coastal Storm Awareness Program. The funded projects will examine how people react to storm warnings and how to best communicate this information to communities and its residents. On Blog: Can Salt Marshes Handle Effluent From a Failed Sewage Treatment Plant? New York Sea Grant funded research to measure if the ecosystem could handle the additional sewage and increase its capacity to serve as a “nutrient sink,” or if the enhanced nutrient loads would shift the ecosystem to an alternative state that perpetuates additional organic matter loading. In late October 2012, Hurricane Sandy split Fire Island, New York into two islands, creating a new inlet to the bay behind it. As seen in a video clip from National Geographic and documented in a photo journal blog, NYSG-funded scientists explain why monitoring the breach is important, as its evolution will affect the tidal dynamics and the ecosystem of the Long Island's eastern Great South Bay. In September 2013, National Geographic placed a spotlight on climate change in its extensive feature story, "Rising Seas," which focused on a central series of concepts: As the planet warms, the sea rises. Coastlines flood. What will we protect? What will we abandon? How will we face the danger of rising seas? The documentary short “Sandy’s Hidden Damage” shows how the storm has changed the city forever – and how experts' opinions on what will save New York clash while some New Yorkers affected by Sandy feel left behind. This radio and Web series examines the causes and consequences of sea level changes in south Florida, the Gulf Coast, New York City, and Greenland, where ice-melt is going to make the world a very different place. In a November 2013 interview with MyLITV, Dr. Malcolm Bowman explains what U.S. East coast communities should do to prevent "Sandy-Like" damage. October 30, 2012: NBC News/Cosmic Blog - "NYC flood was foreseen: Now what?" November 1, 2012: NBC News/Rock Center with Brian Williams - "Hurricane Sandy provides 'wake-up call' for cities at risk of flooding"
November 1, 2012: National Public Radio - "Protecting New York From Future Flooding"
November 2, 2012: ABC News - "Superstorm Sandy Spurs Talk of Sea Barrier for New York"
November 8, 2012: NPR On Point - "In the wake of Hurricane Sandy, New York looks at sea walls"
Also, check out May 2011's SBU Provost Lecture - Malcolm Bowman: Tsunami: Could It Happen To Us? November 20, 2012: On YouTube: PBS News Hour - "Protecting NY From Future Superstorms as Sea Levels Rise"
November 12, 2012: On YouTube: Regional News Network - "After the Storm - Could All The Flooding Have Been Avoided?" Climate change poses significant risks to New York City’s communities and infrastructure. Hurricane Sandy has focused attention on the effects that extreme climate events have on New York City, reminding New Yorkers that the city is vulnerable to a range of climate hazards today and in the future. To help respond to climate change in New York City and accomplish the goals outlined in PlaNYC, the City’s long-term sustainability plan, Mayor Bloomberg convened the First New York City Panel on Climate Change (NPCC1) in 2008. The NPCC – a body of leading climate and social scientists and risk management experts – was charged with advising the Mayor and the New York City Climate Change Adaptation Task Force on issues related to climate change and adaptation. It produced a set of climate projections specific to New York City. Following Hurricane Sandy, Mayor Bloomberg convened the second New York City Panel on Climate Change (NPCC2) in January 2013 to provide up-to-date scientific information and analyses on climate risks for use in the Special Initiative for Rebuilding and Resiliency (SIRR). In response to the Mayor’s charge to the Panel, this 38 page report provides new climate change projections and future coastal flood risk maps for New York City. This climate risk information is designed to inform community rebuilding plans, and help to increase current and future resiliency of communities, and citywide systems and infrastructure to a range of climate risks. "New Climate Data Depict a City More at Risk"
This symposium continued the discussion between academic and local communities of Long Island on the impacts of natural disasters, like Superstorm Sandy. On examination were issues such as the post-storm impacts (what have we learned), hazard preparation and avoidance, what can be expected in future events, and some of the political and legal issues central to the discussion. The format included talks from distinguished guest speakers and an open discussion from a panel forum. "Hurricane Sandy Symposium Will Explore Climate Change, Storm Preparation"
Since Superstorm Sandy struck the northeastern seaboard on October 29, 2012, causing enormous destruction and misery, there has been a multitude of voices raised as to what we should next. For many years there has been often unwise development of industrial, commercial, residential and recreational properties along our coastlines. Should we rebuild, redesign, or retreat? What is the legacy we are leaving to the next generation? A group of experts debated these issues, discussed the dilemmas and pointed us toward what are the correct questions we should be asking. "Looking to Russian Engineering to Defeat New York's Storms"
"Preparing for the Next Big Storm"
"NY debates expensive storm surge barrier"
"From Salt Marshes to Sea Barriers, Preparing for the Next Sandy Defense"
"Defending New York City Against Hurricanes With Barriers"
The surge from Superstorm Sandy was 14 feet — 2 to 3 feet higher than anything that had happened before and 2 feet higher than what anyone had forecast. “So this was flooding on a level that had not been predicted and was much worse than anything we had seen," said David Gmach, director of public relations for Con Edison, addressing a a room packed with Village residents during a meeting of Community Board 2’s Environmental Committee earlier this year. In the wake of Hurricane Sandy, politicians and planners are talking about building a series of walls and gates across this five-mile gap, as well as at other important watery interchanges. It’s an idea that once had only been discussed at “visionary” planning conferences and in engineering papers. If built as envisioned, this storm surge barrier, called the New York–New Jersey Outer Harbor Gateway, could also include a highway, tunnels, and a rail line. Malcolm Bowman and his fellow Stony Brook Storm Surge Research Group investigators have done much of the initial work on barriers for the New York City region. In 2005, Bowman wrote a New York Times op-ed piece in the wake of Hurricane Katrina that both advocated a system of storm barriers for New York City and predicted the future. “The question is not if a catastrophic hurricane or northeaster will hit New York, but when,” he wrote. "New York VS. The Sea"
This feature story put a spotlight on what scientists, including Bowman, and officials had to say in the interest of, as the magazine put it, 'trying to protect the largest U.S. city from future floods.' Says Bowman, "My viewpoint is not that we should start pouring concrete next week, but I do think we need to do the studies." "Storm of the Century* (*Every Two Years)"
As discussed in this feature story, the chances of severe flooding in New York City will be as high as one in two each year by 2100, in part because the U.S. East Coast is a hotspot for sea-level rise. Experts may be reluctant to recommend the ultimate protection measures for New York City: building massive barriers that would cost billions of dollars and moving communities out of the lowest-lying areas. But Malcolm Bowman, a researcher at Stony Brook University's School of Marine and Atmospheric Sciences, floated a plan several years ago for three barriers that would primarily protect Manhattan. His suggestions, as well as what engineers and others consider feasible solutions in this rather complex issue, are explored in "Storm of the Century* (*Every Two Years)." In addition to the nine page article, there are some comprehensive visuals on: (1) the effects of global sea level rise on the U.S., (2) where the storm surge barriers should go (pictured), and (3) how local fixes can help lessen the loss from flood damage to NYC's coastline ..
"Editorial: Don't rush to plugFire Island breach"
SBU's Malcolm Bowman: "Superstorm Sandy – How did it happen and are we prepared for the future?" SBU's Larry Swanson: "Remember Long Island's lagoons in future storm planning"
SBU's Chris Gobler: "Keep Inlet Open for Bay Health"
SBU's Charles Flagg: "The Flooding is Up & Down The East Coast - The Breach at The Old Inlet Is Not Contributing To It"
"Breaches from Sandy to be filled in"
"N.Y.'s Fire Island assesses future after Sandy"
"Fire Island's Future in Question After Hurricane Sandy Leaves Destruction Behind"
"Marine experts: Leave Sandy breach alone"
"Breach Creates an Opinion Divide"
"Halcrow Presents Conceptual Design for Storm Surge Barrier to Protect the New York Metro Area"
"Fire Island's Storm Breach Spurs Debate"
"Stony Brook hosting post-Sandy tech roundtable"
"Post-Sandy strategy for LI regional panel"
"Friday's "MSNBC Live with Thomas Roberts" line-up"
"After Superstorm Sandy, Developers Look at How to Prevent Future NYC Surges"
"Kiwi Leading Call to Block Sea Surges"
"VENICE ON THE HUDSON? - New York considers massive floodgates to protect against storms"
"Navy Yard Still Recovering After Hurricane Sandy"
"Flood protection touted for NYC"
"Manufacturing Islands; Superstorm- Protection Plans Weigh the Possibility of Adding Land to the Harbor"
"FEMA: Sandy impacted 95,534 buildings on LI"
"South Ferry subway station may be closed for three years"
"Scientists study effects of superstorm Sandy"
"Disaster Capitalism Hits New York - The city will adapt to flooding—but at the expense of the poor?" "Disaster Capitalism Hits New York"
"Sandy gives New York oil supply lesson"
"New York Oil Supply: How Sandy Taught Empire State A Tough Lesson About Fuel"